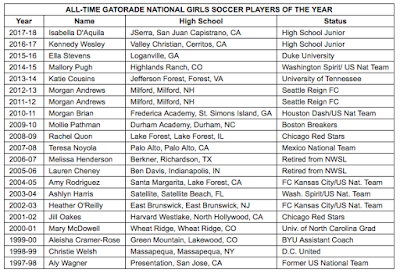 In its 33rd year of honoring the nation's best high school athletes, The Gatorade Company announced Isabella D'Aquila of JSerra High School (San Juan Capistrano, Calif.) as its 2017-18 Gatorade National Girls Soccer Player of the Year. D'Aquila was surprised with the news by Seattle Reign FC's Morgan Andrews. "Already a superior player, Isabella raised her game yet another notch as a junior—her game has evolved, she's cleaner on her finishes and she scores the type of goals that others simply cannot," Sheldon Shealer, High School Soccer Editor for TopDrawerSoccer.com, said. "Many people think of her as a finisher based on her goal totals and her aggressive play, but she's also a creator for others as evidenced by her 15 assists this past season. On a high school team loaded with major college talent, she stands out heads and shoulders above the rest." The award, which recognizes not only outstanding athletic excellence, but also high standards of academic achievement and exemplary character demonstrated on and off the field, distinguishes D'Aquila as the nation's best high school soccer player. A national advisory panel comprised of sport-specific experts and sports journalists helped select D'Aquila from nearly 375,000 high school soccer players nationwide. D'Aquila is now a finalist for the prestigious Gatorade Female High School Athlete of the Year award, to be presented at a special ceremony prior to The ESPY Awards in July. The 5-foot-7 junior defender scored 39 goals and passed for 15 assists, leading the Lions to a 22-2-3 record. D'Aquila is a member of the US Soccer Under-17 Women's National Team and is a two-time Southern Section Division 1 Player of the Year. D'Aquila has maintained a weighted 4.31 GPA in the classroom. She has made a verbal commitment to play soccer on scholarship at Santa Clara in 2019. "Isabella embodies everything we look for in a Gatorade Player of the Year recipient," Gatorade Senior Vice President and General Manager Brett O'Brien said. "In addition to being one of the best high school girls soccer players in the country, Isabella has excelled in the classroom and been a positive influence in her community. She is a role model for younger student-athletes to look up to and we are excited to see all the things she will accomplish in the future." As a part of Gatorade's cause marketing platform "Play it Forward," D'Aquila also has the opportunity to award a $1,000 grant to a local or national youth sports organization of her choosing. She is also eligible to win one of twelve $10,000 spotlight grants for her organization of choice, which will be announced throughout the year. The Gatorade Player of the Year program annually recognizes one winner in the District of Columbiaand each of the 50 states that sanction high school football, girls volleyball, boys and girls cross country, boys and girls basketball, boys and girls soccer, baseball, Soccer, and boys and girls track & field, and awards one National Player of the Year in each sport. 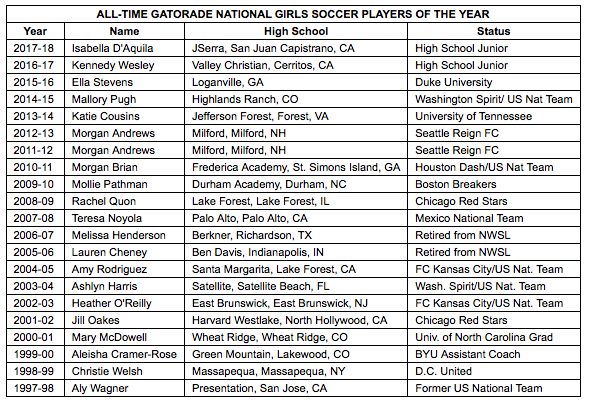 For more information on the Gatorade Player of the Year program, including nomination information, a complete list of former winners, and future announcement dates, visit the Gatorade Player of the Year Web site at gatorade.com/poy, on Facebook at facebook.com/GatoradePOY or follow us on Twitter at @Gatorade.